I hang my head in sorrow or shame, I’m not really sure which. “Yes, Papa, I know. Where do I start?” I have no idea what to do, what is expected of me here. “Start here,” He directs, handing me one of the roses. I am grateful to accept His direction. Taking the rose, I look at it closely, but see nothing that makes any sense. “It is the expectation of rejection.” He says simply. The words hang heavy in the air. “I thought we had dealt with this already,” I swallow hard, vividly remembering that time and that correction. “Yes, Papa. I will” My heart is heavy though. “Why is this so difficult when I know what You have always given me, done for me, has always been good?” I am so frustrated in my own responses and confused by my own reactions. I have hope, this is something that I can do. “Yes Papa.” I begin the process. There are metal petals on the flower, many faces that come to mind, family, teachers, friends, many others. Soon the water is covered with crushed petals; only the stem is left. “Break up the stem and release it as well lest the blossom grows back.” He instructs. “It is all your own fault” cries one. “You have deserved what you have received.” Shouts the other. The voices cut through my heart, as though the thorns are embedded there as well. I am stunned, frozen, not knowing what to do. Tears run down my cheeks, I keep trying to hide my wounded hands from sight. When I open my eyes for a moment, I find He is standing right beside me. His words sit heavily with me. I realize I am afraid to show Him my wounds. “I will not condemn you for your wounds, daughter.” Even in His sternness, His tone is gentle. His words reverberate through my soul. Always I have believed that I could not show Him my woundedness, that He would be angry at me for being wounded. Now He tells me this is not so. I cannot hold back the tears. The pain of the thorns and their call is too much to contain in the light of what He has just said. “Please, Papa!” I press my hands towards Him. With incredible gentleness He removes the deep thorns from my hands, crushing them, silencing them. As He washes the wounds in the cool clear water of the pool, I hear the song of grace in my ears. It was always there, I realize, I just chose not to listen. Finished tending my hands, He take them in His and presses them fondly. I find I feel so empty now. The constant presence of that assumption is gone now, but I have nothing to take its place. Is this how it is to be? We walk through the grove and through the shade garden and beyond. I do not know what to say, so I say nothing. The silence between us is both comfortable and comforting, not strained nor tense. We are now in the sun again, in a large open field at the back part of the garden. The question stops me in my tracks. My first instinct is to say yes, but I hesitate, knowing the inconsistency of my heart. “I want to, I think I do, but I’m afraid I do not know my own heart, that if I say yes, it won’t be entirely true. I am afraid that You will be angry…” I stammer, trying to answer. “Then make it a statement of faith.” He replies. I am struck by the simplicity of what He is telling me. I know faith is always pleasing to Him! “Yes, Papa! Yes, I do—I do trust you!” I cannot believe the joy and release that floods in as the words pour forth. His reaction, though, stuns me! Laughing deeply and fully, He suddenly sweeps me into His arms and swings me around like a child. I laugh too, more fully than I remember laughing before. In His arms I feel like I am flying, soaring, more accepted that I have ever felt in my life. When my feet finally touch the ground again, I have to cling to His arms for balance, still laughing heartily. The emptiness is gone now, replaces by the laughter and acceptance of my Papa. 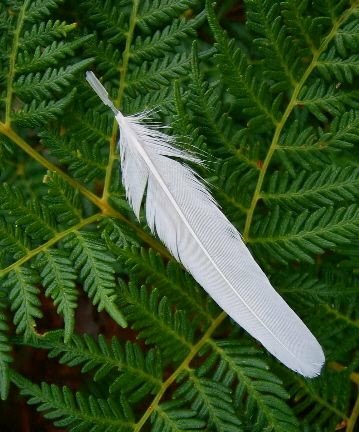 On the ground in front of me I see a large feather and realize it is from the eagle we had seen soaring above the garden. “Papa, thank you!” I whisper, no other words seem available to me right now. “I will not leave you empty.” He reminds me. “Come.” He takes my arm in His own and we walk. “That you have changed,” He replies, a smile in His voice. He pats my arm comfortingly, “The flesh does not like to change, the process is always hard.” We continue to walk, circling the whole of the garden. “Let’s return now.” So we walk back to the grove, stopping at the flat stone holding the remaining roses. I lay the feather down, in place of the first flower. The contrast between the old and the new is striking. The feather seems to shimmer in the light, emphasizing the lifelessness of the roses.